The Amazing Organic Fertilizer That Grows Plants Like Crazy! "The Amazing Organic Fertilizer That Grows Plants Like Crazy"
If you want big tasty healthy organic fruits and vegetables, a thick lush green organic lawn, and flowers that are covered with large long lasting colorful blossoms, then this might be the most important letter you'll ever read. Your plants grow bigger, better, faster, with reliable consistent results using our natural organic fertilizer or your money back. Reason one: Of course you have heard that we have helped thousands of people just like you grow thick carpet like natural lawns and lush high yield organic vegetable gardens and beautiful blossoming flower beds by eliminating harmful chemicals and using our unique tested and proven all natural organic fertilizer to boost plant hardiness and plant growth. Reason two: You become really interested when you see we have more testimonials than we can list on this page filled with success stories of gardeners, farmers, lawn care professionals and nurseries that have become fiercely loyal to our organic fertilizer because of outstanding results, especially compared to previous seasons with different natural and chemical products that didn’t live up to their price tag. Reason three: Thousands and thousands of requests are pouring in, so many that we can only pick those that demonstrate the strongest interest in growing organic with top results. We only have time to select and service those gardeners and farmers that are most eligible to receive our all natural fertilizer. 2) Liquid formulation for super easy application. Can you see how easy it is to just to spray it on with your hose. We send you a hose end attachment with your order. All you have to do is screw the bottle on to the end of your hose and start feeding your nutrient starved plants everything they need. 3) Non-leaching formula chelates with the soil. Just picture how your plants and soil eat this up. As you spray the light organic mist on it absorbs gently through the leaves and completely into the soil and you don't have run off the next time it rains. It binds in the soil so your hard earned money is safe using a tested and proven liquid organic fertilizer. 4) Contains liquid kelp from the cold waters off the Atlantic coast of Canada with more than 60 naturally occurring major and minor nutrients. You probably already know this but kelp is natures gift to gardeners and farmers giving your plants increased tolerance to disease by strengthening the cell walls and improving nutrient absorption. Imagine big strong delicious tomatoes and flowers. Your plants start to eat right when you spray it on. Our special formulation works as both a soil fertilizer and for foliar feeding. As soon as a drop lands on the nutrient starved leaves of your plants they devour it. 6) More cost effective than using chemical fertilizers. It is a double bonus, you save money using our all natural organic fertilizer. You may be wasting money right now on other fertilizers that are turning into toxic run off and throwing your soil chemistry and biology out of balance hurting your plants in the long run. Your gardens are healthier and produce more flowers and more fruits for less money than other fertilizers. Imagine, the money you save you can use to buy more plants. 8) Fish and Kelp formulation is well rounded, proprietary, and very robust. Our unique formulation is multi-purpose, you can spray it on and cause virtually every type of plant that you raise to grow green and strong. 9) Plant hormones from liquid kelp reduce or eliminate the need for pesticides or herbicides. You spend hours and hours preparing your soil and gardens to produce the best possible results but there is still the worry about pests. You can strengthen your plants natural resistance to these intruders and improve your yields. 10) Natural plant hormones provide drought and stress resistance. Less watering and less worry whether your plants are going to survive the 4th of July weekend without you there or not. Our liquid organic fertilizer provides the missing pieces to your soil and ignites a firestorm of beneficial microbial activity causing your plants to grow strong and proliferate like weeds. And you begin to notice a liquid organic fertilizer that is a proprietary, highly guarded, all natural fish and kelp formulation. We surprisingly discovered a fish with unique properties to cause your garden to flourish. We use the same fish sources year in and year out because of the proven results for your garden by keeping the core of our secret formula absolutely consistent. For the same reason we use the same kelp sources year in and year out because years of research and testing have created the formula that is tested and proven. We spend the money to make the best possible all natural fertilizer available for solid results on your farm, or in your garden, or on your lawn. Each spring we rake off the flower beds as winter resides and the first signs of spring growth appear. Then we apply Liquid 4-3-3 with the hose end sprayer. It is just a given that you can see the rapid response to the fresh application of the 4-3-3 as flowers sprout faster, healthier and more vigorously... My wife often hosts visitors who come to walk past her gardens in the spring. These visitors often remark about how healthy and large our plants look compared to theirs." "I've used it on all of my lawns. The soil here is like concrete in summer. By the middle of summer we used to have no lawn, only weekends. Thanks to your Natural Organic Fertilizer we have a really healthy lawn and grass grows when it never used to." "...I then sprayed again using the recommended mixture when my tomato plants showed their first bloom. The result was about 30% to 40% more tomatoes on each vine." "These cobs are as big around as soda pop cans and 12 to 14 inches long. The yield was great because there were so many kernels on each cob. These products have been nothing less than fantastic." We started raising the pH level by applying the Liquid Lime. Then we put down the first round of 4-3-3 and sprayed with an environmentally friendly herbicide. The results were dramatic. Weeds started dropping and the grass was growing strong. Our first cut yielded 97 thousand pound round bales of hay. This was about twice the yield of other area farms." 1)You must have a reliable and tested organic formulation with a proven track record for at least 20 years. 2)You must have strict quality control to assure your formula is contaminant free and contains only the exact ingredients to provide huge healthy plant growth. 3)The natural formula must have the correct selection of natural ingredients to promote early ripening, improve quality, and extend the shelf life of fruits and vegetables. 4)Your natural organic fertilizer must absolutely be "natural" no questions and no tricks it needs to be tested and certified. 5)Specific natural plant hormones that dramatically increase tolerance to heat, to cold, and to drought. We have cut out all of the middle men retailers and created a factory direct saving opportunity for you. Instead of paying full retail price we are taking all of the savings and passing them straight through to you. My business partners think I'm nuts but I know this is good for the planet and I love nothing more than a happy customer. Head to the store and you would pay double what you can get here today right now but you would buying another season of what you had last season. The years of formulating and perfecting the blend in our natural organic fertilizer have created results that make our fertilizer worth virtually 10 times what we are charging for it. 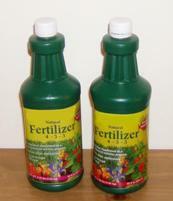 You get all natural liquid fertilizer in our most concentrated form and supplied in 2 quart amounts (in 2 bottles we have sized for application convenience). This is enough to treat 10,000 square feet of lawn or garden. For most this covers the spring or fall season. It is safe and non toxic and stores well up to two years. A simple step by step comprehensive guide on how to use natural organic fertilizer, how much to apply, and how to apply it. You will know exactly how to grow healthy strong plants with a natural organic fertilizer. The revealing report "Easy Steps to Natural Lawn Care" that reveals the secrets to organic lawn care success. A hose end sprayer attachment to connect directly to our fertilizer bottles. Simple and clean. Your satisfaction is assured through our no risk, you-can't-lose, 100%, no-questions-asked, iron-clad moneyback guarantee. If for any reason, you aren't thrilled and satisfied with our product, just contact us (or send the product back) within 6 months and we'll refund 100% of your purchase price. No hard feelings. What I'm saying is, don't decide now if this product is for you. Just get it and try it out. If it doesn't do everything I say and more, if you don't save money, time and frustration, if it isn't life-changing, if it doesn't work for you, you have nothing to worry about because you can get every dime of your money back under our no-loopholes guarantee. So you have nothing to lose and everything to gain. P.S. Remember, our supply of free bonuses is limited. I can only guarantee you'll receive them if you order right away. So don't delay. Act now while it is still fresh on your mind.